The first day of the year should be celebrated with something new and fun, so here's my take on that idea. I have resolved to make more art this year. And have several ideas rolling around in my head. Number one is to find a way to make several designs in a repeated fashion, so that I could create cards easily. So that is how this hopeful little bird with a heart shaped message to deliver for the new year came about. Carving the linoleum was a challenge, because the linoleum is a bit hard. And I hope it does not look too primitive. I used some acrylic gouche paint for my print and made several postcards for a birthday card swap I am in on Milliande. Another new thing I learned is how to upload pictures from my phone and post them on my laptop. So although I am without my regular computer and scanner, I will be able to get back to blogging. Yay! for bright New year! I am on my way to some new creative explorations. 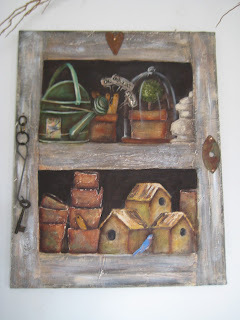 Patty you know I have always loved your art and especially your birds,these cards are wonderful. What a lovely stamp! I love it! 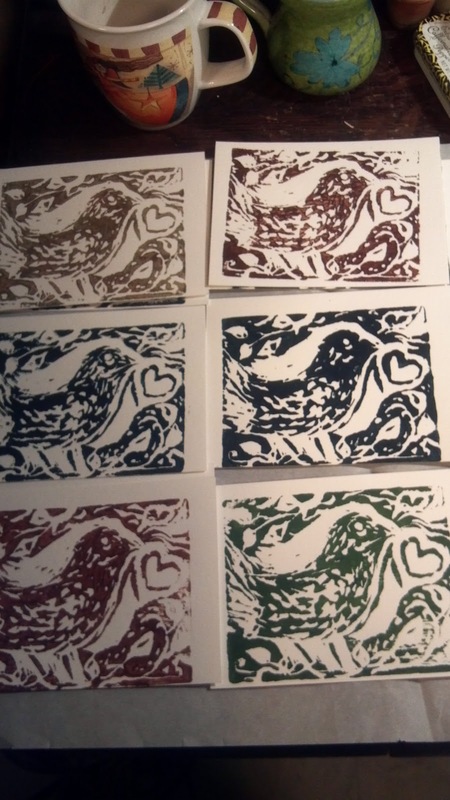 Birds and hearts, what could be more wonderful! :) I am looking forward to see more of your art Patty! Fabulous prints & great carving! 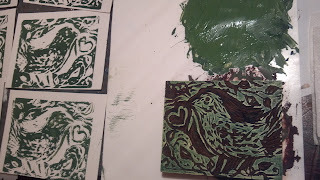 I have not carved linoleum in a very long time because it is so tough & I'm prone to accicidents with sharp tools. 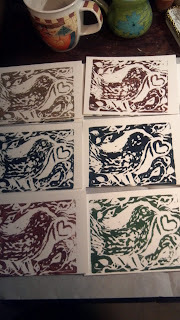 Happy new year..fantastic lino cutting..something I have never tried but yours are an inspiration! You're off to a great start this year in your creations. Your prints turned out great. 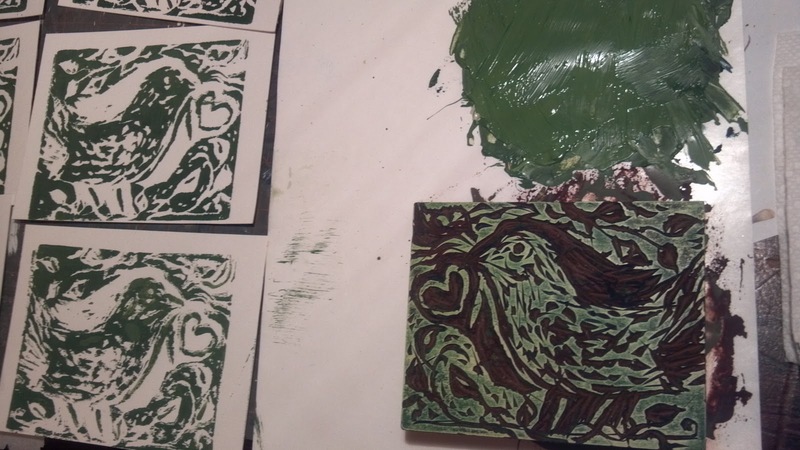 I've always loved the way linoleum prints turn out but they are so difficult to do. I'm glad you stopped by my blog and left your website. I hope this is a fabulous and creative year for you! P.S. I like your cat, I have one too but he's always walking all over my artwork too! Patty, primitive is good -- that's what I like about linoleum prints. Yours is just beautiful. Wishing you all good things in the coming year! I love your block print! I did our xmas cards that way this year, so much fun!